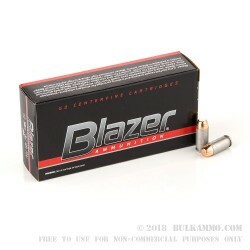 A bulk case of CCI Blazer .40 SW ammo is perfect for those who want hours of trigger time at an affordable price. 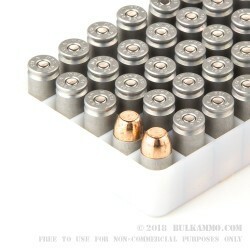 Each case contains 1000 rounds distributed between twenty boxes that each hold fifty individual rounds. 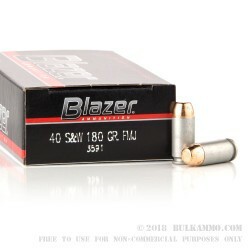 The .40 S&W by Blazer utilizes a lead slug with a copper, full metal jacket (FMJ). This is to prevent weapon deterioration and improve accuracy over the life the weapon. In addition, the FMJ provides greater penetration upon impact as it mitigates the expansion of the bullet. The aluminum casing of these rounds are packed with 180 grains that propel the bullet at an average velocity of 985 feet per second. The round is ignited by a Berdan primer, which is a more cost-effective method when compared to boxer primers. These two factors help make this ammunition an economical solution for those wanting range time but do not allow the casings to be reloaded. The .40 S&W ammunition is great for those on a budget and want to find a low-cost solution to be able to shoot hundreds of rounds for practice or leisure. Highly recommended. 1000 rounds through G23 and G22, with 1 FTF on the last round in an old magazine - probably time for a new mag spring. Ammo was flawless. Fast Service. Good product, Good price. Will buy more. Q: Does anyone know the velocity on this? Looking for some cheap, but reliably subsonic ammo for plinking with my can. A: Hello David, CCI lists the velocity of this ammunition at 985 fps. 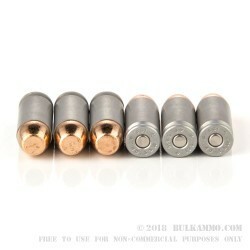 Q: Are these casings harder or easier to reload than brass? A: It is not possible (or recommended to attempt to) reload these cases. Q: wondering if any customer has had cycling issues with this ammunition; I have tried a box or two of the steel? casings, and my Springfield XD didn't like them very much. The problem ammo came from Wolf, a russian brand, I believe. Been leery of this type of casing since; have run many other varieties through my XD, no problems save the steel casing. thanks! A: This ammo is loaded with an aluminum case in the US. You might want to try a small amount before buying in bulk, but this ammo should work well in your XD. Q: I notice there are two different CCI Blazer .40 cal S & W 180 grain FMJ ammo types for the same price. This one says the casings are Boxer-primed aluminum and the other says the casings are Boxer-primed brass. What is the difference? Why would one prefer one over the other since they are identically priced? A: The brass cases are reloadable, while the aluminum cases are not. While this does not really matter to non-reloaders, the brass cases will have a higher residual value for sale or trade.